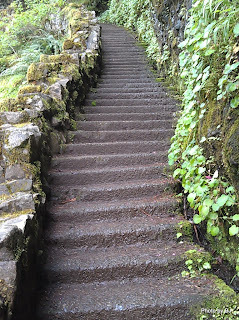 We left Champoeg State Park on the 29th and headed for Silver Falls State Park. Silver Falls is located in the western foothills of the Oregon Cascades surrounded by Christmas tree farms. There were a few sites in use or reserved, but lots to choose from. All of them have paved parking pads and many have water & electric utilities. A few have full hook-ups. The restrooms are very clean and the hot showers are free. We drove into Sublimity to get fuel and then looked for a place for lunch. We ended up just down the road at Kelly’s Café in Stayton because we liked the name even if they spelled it 'wrong.' It was a great find - hand pressed hamburger patties, thick cut bacon, and fresh cut French fries. The forecast had shown a high likelihood of rain but we ended up with some blue sky showing between the clouds. The desert gal thought it was chilly but others were hiking in shorts and tee shirts. berries were blooming along the trails and roadways. and some of the walls and stairs on the trails. The only down side is that we couldn't find cell signal anywhere in the park and it's the better part of 20 miles to town either direction making it a bit of a challenge to keep the blog current. In addition to the wonderful people at the NOG (they clearly love the potluck and with good reason!) there is a lot to do in the surrounding area. We tripped across the Antique Powerland Museums located in Brooks, about 15 miles south of the park. They have an exceptional truck museum ($5) that initially attracted my attention. The collection ranges the gamut from hard rubber, chain drive trucks to nearly new prototypes. About 18 miles west of the park in McMinnville is one of the nation's best aviation museums. The Evergreen Aviation & Space Museum houses the Hughes "Spruce Goose" and many other quality exhibits. They have especially strong collections of helicopters and military aircraft. They have a second matching building with space exhibits and more aircraft and a separate IMAX theater. Since I last visited, they've added a very unique indoor water park. With a 747-100 on the roof forming the top of some of the water slides, it's difficult to miss seeing this new facility. That is a vineyard in front, part of the Spruce Goose Vineyards. Prices for the Aviation & Space museums plus the IMAX is $25 for adults. The waterpark is priced separately. If you're looking for good food, friends recommended Red Hills Market one block off the main road in Dundee. It's just 8.5 miles from the park and much closer if you're a crow. Wood fired pizzas, wonderful sandwiches, special salads, etc. It was excellent. Fair warning - the parking lots were jammed early Saturday afternoon. Since we're here at Champoeg State Park, we decided to go out and wander the countryside today. It was another blue sky day with the mountains out in all their glory. Beautiful, but very difficult to for me to photograph. and, of course, the old barn picture of the day. waiting for the potluck and for the moon to rise again. along with Bolers in various sizes, Escapes of various models, and multiple BigFoot (BigFeet?). Good conversation and a nice chance to put faces and names together. Even Turk is enjoying it. and blue, blue sky. Beautiful! There is some of that drippy stuff in the forecast for the future, but so far, it has been beautiful! While on our Covered Bridges hunt, we discovered one of the smaller covered bridges in area. It was built by community spirit in 1988 and serves as a portal to Rolling Rock Park and a conversation piece in Lowell, Oregon. to a tracked arch for dragging logs out of the woods with an early bulldozer. and a caboose that originated with Southern Pacific but was used by Weyerhaeuser on a local line for a number of years. For a town of about 1,000 people, they've done a lot to celebrate their history and plan for their future. The Rolling Rock Park also serves as the home for the Blackberry Jam Festival held annually in late July. Since Valley River Center allows two nights "boondocking" right next to a beautiful running / biking trail and the Willamette River, we took the day to search out rarities for which Lane County is famous. Lane County maintains more covered bridges (14 are open to traffic) than any other county west of the Mississippi, and for this west coast couple, covered bridges are rare! We started at the Pangra bridge near Lowell, simply because is was the first of a cluster relatively close to our starting location. This bridge uses the two longest single piece bridge timbers ever cut in Oregon. Built in 1938, the upper chords show the marks of the adze used to final shape them. The all white paint is typical of nearly all of Lane County's covered bridges. The Unity bridge featured a full length awning window on the upstream side for traffic safety since the bridge forms one leg of a four way stop. The Lowell bridge was originally built in 1945 and raised 6 feet in 1953 before the Dexter Dam was completed. It is the widest covered bridge in the county and is no longer used for traffic. It is now nicely organized as an interpretive center. This hand-built model of the Lowell bridge clearly shows the design of the Howe truss that was used in nearly all of these bridges. The diagonal wood members are in compression and the vertical steel rods are in tension. Bridge builders preferred to use solid beams. This piece, removed when a bridge was rebuilt, is approximately 16 x 30 inches. Lane County built wood bridges through the end of WWII in order to divert steel to the war effort. The Office bridge, in Westfir, is the only red bridge in the county. It's also the longest covered bridge in Oregon. Originally built by Western Lumber Co to connect the company town and office to the mill, it was designed with a triple truss for use by logging trucks. It's the only bridge in the county with a separate covered walkway, making it easy for the mill workers to walk to work. The mill burnt in 1980 and is now replaced by a trailhead parking lot. We visited almost half of the covered bridges in the County today. Lane County has a brochure telling a bit about each bridge. A Point Of Interest file from the POI Factory for the GPS was very helpful.